Affordable housing has been tougher and tougher to come by in D.C. in recent years, and city officials have been taking steps to preserve and create new housing options for low-income residents. But even as those efforts are taking place, many housing advocates admit that they may be coming too late. Nowhere is that more obvious than Museum Square, a large building in the Mt. Vernon Square neighborhood occupied primarily by Chinese residents. 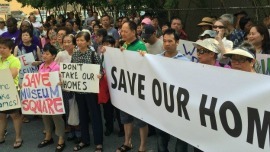 Since last year, they have been fighting the owner of the building over a proposed sale that could leave the residents with nowhere else to live. The owners have offered to sell the building to the tenants, but the tenants claim the price tag is so high that it violates the law that grants them the first option to buy a property being put on the market. That fight reaches a milestone this week, as a federal contract that helped keep the building affordable expires. Museum Square residents and their advocates will be rallying outside the building this afternoon, pledging to remain in place until legal issues around the sale are clarified. What are those legal issues? And what have D.C. officials done do help the residents remain? Read on for everything you need to know about Museum Square. Museum Square is a 302-unit apartment building located at 401 K St. NW, in Mt. Vernon Triangle. For the past 30 years, all the units have been occupied by low-income tenants who receive rent subsidies through the federal Section 8 program. Under the program, the residents — the overwhelming majority of which are Chinese — pay 30 percent of their income towards rent, and the federal government picks up the rest. As of this year, monthly rent for most tenants came in under $300, with the U.S. Department of Housing and Urban Development kicking in roughly $1,100. That's far below the median price for a one-bedroom in the neighborhood: $2,350. In late 2013, the owner of the building — Parcel One Phase One Associates, a part of Bush Companies of Williamsburg, Virginia — announced that it would not be renewing its Section 8 contract after it expired on Oct. 1, 2014. (This was later extended to Oct. 1, 2015.) It told residents that it intended to demolish the building and replace it with over 800 market-rate apartments and condos, as well as commercial space. As D.C. law requires, it offered to sell the building to the tenants, but for $250 million — over $800,000 per unit — with a five percent down payment. The residents have said they can't pay that, and risk being evicted. As The Washington Post has reported, that would represent a significant change for the area — there aren't many Chinese residents left in or around Chinatown, and if Museum Square were demolished there would be even fewer. The building also houses many black residents. Of course, as with most legal issues, it comes down to interpretation — what does a "bona fide offer" actually mean? In a lawsuit filed in January 2015, the tenants said the offer did not comply with the law. Specifically, they argued that the $250 million price tag did not “reflect a rational, fair, and objective value of the Property.” They cited an appraiser who set the market rate of the building — under its current use — at $68 million. Bush Companies defends the sales price, saying it reflects what the building could be worth if redeveloped. In its response to the lawsuit, it pointed to a similar case in which the Phillips Collection — an art museum in Dupont Circle — purchased an adjoining building for $1.4 million and then offered to sell it to its tenants for $7.8 million two years later. But in April 2015, a D.C. judge agreed with the tenants. In his ruling, Judge Stuart G. Nash wrote that "it is beyond dispute that the methodology adopted by the defendant was neither designed to, nor did, achieve a reasonable estimate of the property’s current market value." The judge also ordered the company to send letters to all residents rescinding a prior eviction notice. What have D.C. officials done? Soon after news broke of the $250 million sales price, D.C. officials jumped into action. Both former D.C. Council member David Catania (I-At Large) and Mayor Vincent Gray introduced separate measures tweaking TOPA so that any sale of this sort would have to be pegged to an independent appraisal of the property. This year, the Council passed an amended version of Catania's bill. Introduced by Council member Anita Bonds (D-At Large), the measure allows tenants seeking to purchase a property that would otherwise be demolished or converted to non-residential use to request that an independent appraisal be conducted to determine the market price of the property. In short, the bill would resolve the debate over what "bona fide" means by letting an appraiser chosen by both parties settle the matter. But it might not prevent Bush Companies from pushing forward on the $250 million sales price. That's because the law allows the seller to set a price based on what they can do with the property "by right." That means that if Bush Companies can show that a new building can be built at Museum Square without any changes to existing zoning rules for the site, it can set the price based on what may eventually end up there. So what's happening to the residents? The Section 8 contract expires tonight at midnight, and Museum Square residents are worried that their rents could skyrocket, forcing them to move. A June 29 letter from Bush Companies said as much: "Once the contract expires, HUD will no longer approve the monthly rent amount charged and the rent may change from time to time based on market conditions." According to the letter, residents were told to expect their rent to jump from the $300 they've paid to almost $1,500 per month. But affordable housing advocates say that the letter was a misleading ploy to drive residents from the building. Though the letter did say that residents could be eligible for individual housing vouchers, advocates say that the building's management has been refusing to process them. The advocates also say that the management has stopped residents from organizing. Residents and advocates plan on rallying outside Museum Square today at 4:30 p.m., where they will declare that they have no intent to move. Housing advocates say that evictions are not a risk yet, but some privately worry that some residents may willingly vacate their apartments over fear or misunderstanding of what their rights are and whether they can afford to continue living in the building. If that happens, they may not have many options in D.C.
"[The residents] had a meeting last week with the Housing Authority, and some of the residents expressed the concern that the units they are locating are over what their voucher calls for. It's not even just close, even far away they're not able to find affordable housing," said Rachel Johnson of the National Alliance of HUD Tenants, speaking on WAMU 88.5's The Kojo Nnamdi Show. As that portion of the fight continues, another portion remains in the courts. Bush Companies appealed the April decision against them last month, saying that an independent appraisal requested by the tenants had actually found that the building — if demolished and rebuilt as 800 new units with commercial space — would be worth $253 million. That, it says, proves that it had made a "bona fide" offer to the residents. It also argues that TOPA does not require that the offer be based on the assumption that the property will remain residential. "The price of $250,000,000 was not an arbitrary number, but rather was a price derived from detailed and extensive calculations made by a company whose general partner has decades of real estate development experience in the metropolitan area," wrote the company's lawyers. "The analysis of the development value of Museum Square came after 10 years of studying the housing market... and was based on taking into account the more financially beneficial use that could be made of the property," they added. Until that appeal is heard and a ruling issued, the attempted sale of the building has been put on hold.